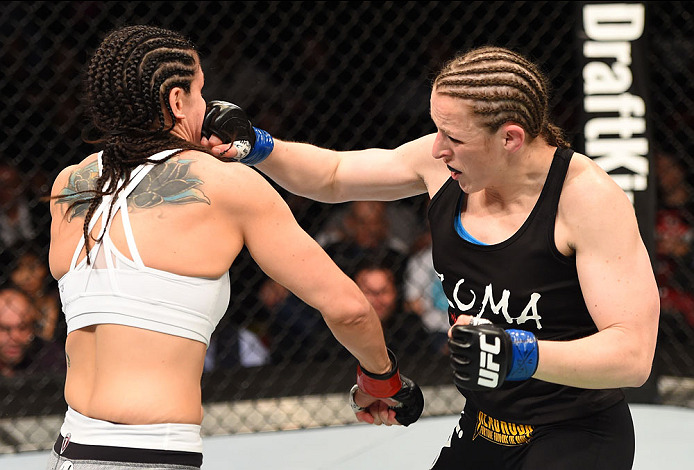 Former UFC bantamweight contender and women’s MMA pioneer Sarah Kaufman will battle for the Invicta FC title when the world’s leading all-female fight promotion returns to UFC FIGHT PASS on Friday, May 4. Canadian Kaufman, who’s record stands at 19-4 and includes a reign as Strikeforce word champion back in 2010, will take on undefeated German prospect Katharina Lehner. Lehner is 7-0 and current training at the famed Jackson-Wink gym in New Mexico. The fight for the 135-lb championship vacated by recent UFC title challenger Yana Kunitskaya headlined Invicta FC 29, which will be held at the promotion’s stronghold of Scottish Rite Temple in Kansas City. The first challenger to the new champion will also be decided on the card. In the co-main event, former No. 1 contender Pannie “Banzai” Kianzad, 8-3, takes on bantamweight newcomer Bianca “Bibi” Daimoni, 7-2. Also on the card, the popular UFC veteran Pearl Gonzalez, 7-3, makes a quick turnaround after earning Fight of the Night honors last month in Invicta. Gonzalez moves up to flyweight to face Brazil’s Bárbara Acioly, 4-2. Another fighter to keep an eye on at Invicta FC 29 is unbeaten Julia “Raging Panda” Avila, who owns wins over reigning UFC flyweight champion Nicco Montaño and UFC bantamweight contender Marion Reneau. She takes on Marciea “Black Widow” Allen. Invicta FC 29 streams live and exclusively via UFC FIGHT PASS on Friday, May 4.